It's Three Clover Thursday Challenge Day, and this week Kerry gave us a this sketch to use. Taking my creative liberties, I've rotated her sketch to use with the Singing Cowboy from Artistic Outpost. To add color to my images I used the Bingo Blast Technique from the April TJNL, using Radiant Rain Daubers. 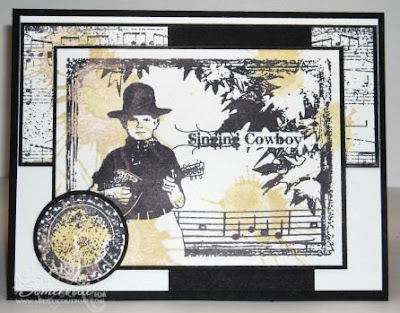 The background stamp used on my card is from Cornish Heritage Farms - Scrapblocks Aged Sheet Music. Gotta love those background stamps! Be sure to check out what Kerry and the other members of the Three Clover Challenge Team created by clicking on the logo on my sidebar! This card is gorgeous, Lisa! Love it! This is a very creative card Lisa. It has a subtle and unique appeal that I find quite Charming. Love how you flipped the sketch. VERY COOL, Lisa!! I don't think these vintage-y images need to be "colored" and all your techniques always look so good with them! Your project for this week's challenge is fantastic! 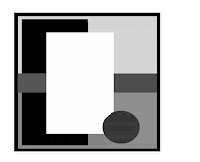 I love everything about it-=-esp. the vintage look. Great job! Oh my sweetie would love this card...he loves anything with cowboys!...and he says the best colors are black and white LOL!